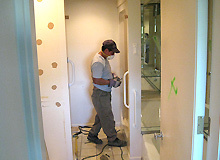 Bathroom Renovation is the process of refurbishing your bathroom in order to make it brighter and better. Nowadays, it is important to renovate bathrooms simply because it has gotten old or because you have just moved in recently. More often than not, bathrooms need to be demolished and renovated if there is a change of ownership of a house or if the is the old wear and tear. 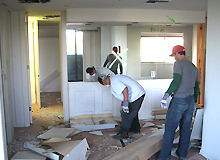 Renovation involves a lot of things and one of the first steps towards renovation is demolition of everything. Demolition does not require a big toolbox; all it requires is planning and the right amount of implementation. Bathroom demolition involves a number of steps. It is strongly recommended that you take help of a demolition professional for removing the pipes and other things, because this will be less time consuming and will help you save time and possibly a lot of money if things go wrong. It is always safer to not put too many things at risk while trying to demolish the bathroom. The first step is to remove the mirrors, shelves, etc. This can be done by gently unscrewing the mirror or scraping off the edges with a knife. The next step involves shutting off the water supply. This is important because without shutting off the water supply, the pipes, when removed, could cause a water leakage! The next step is to demolish the toilet. This means that the toilet will have to be taken out in parts. The nuts and screws at the lower side of the toiler should be used. Similarly, the bathtub or the shower or both should be removed. Remove the cabinets and shelves. Again, it is strongly recommended that a demolition professional be called for the removal of all these items as well. This is not only for saving time but also to make sure that the work isn’t sloppy or mediocre. The last part is to remove the flooring. This is the hardest part and can result in the collection of a lot of dirt and debris. A particular form of garbage disposal system has to be devised in order to let go of the flooring. The help of a professional garbage disposal services helps in effective removal of debris & keep the area completely clean so that further work can be carried out smoothly. Hiring a professional hauling service will also take away the burden of removing the debris off your shoulders. While trying to empty your bathroom, there is a lot of debris and a lot of dust that is collected. Even if everything is uninstalled, it is still a little important to understand that the debris collected is not something of a Do-It-Yourself task. The debris collected could be potentially harmful for you. Also, it may hamper the work that is to be done. This will also ensure that your extra trips to the dumpster are saved. It will also help you clear off the space in a few hours instead of a few days. At Deconstruction Pro this service is provided with great ease and is appreciated by everyone who has used it.